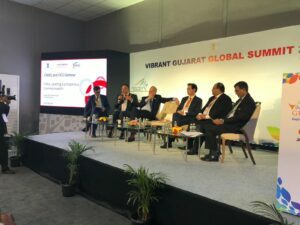 During Vibrant Gujarat 2019, CWEIC hosted an event on the India-Commonwealth connection in partnership with the Federation of Indian Chambers of Commerce and Industry (FICCI). CWEIC Chair Lord Marland was joined on stage by Strategic Partners from Singapore and Canada, and the panel explored the relationship between the Commonwealth and India, and how this relationship can continue to strengthen – specifically in regards to trade. CWEIC Advisory Board members Dr Emad El Dukair, Senior Advisor, Interhealth Canada and Vinesh K Natali, Director, Meinhardt Group (Singapore) both discussed their respective interest in strengthening their commercial ties with India. Interhealth Canada is an international provider of healthcare services specialising in orthopedics and trauma, with offices Canada, Dubai, Kuwait and the UK. Meinhardt Group is global engineering consultancy, planning and management firm, it employs over 4500 people, and has 47 offices worldwide.